Satellite image of Estonia in April 2004. In Laelatu meadow, there have been found 76 species of plants in 1 m2. That is the 2nd largest number of species per m2 in the world. The climate is maritime, wet, with moderate winters and cool summers. Oil shale and limestone deposits, along with forests which cover 47% of the land, play key economic roles in this generally resource-poor country. Estonia boasts over 1,500 lakes, numerous bogs, and 3,794 kilometers of coastline marked by numerous bays, straits, and inlets. Tallinn's Muuga port offers one of Europe's finest warm-water harbor facilities. Estonia's strategic location has precipitated many wars that were fought on its territory between other rival powers at its expense. In 1944, under Soviet occupation, the Jaanilinn and Petseri regions were annexed to Russian SFSR territory. The legal status of these territories has not been fully settled yet, though neither Estonia or Russia has not any territorial claims. Geographic coordinates: 59°00′N 26°00′E﻿ / ﻿59.000°N 26.000°E﻿ / 59.000; 26.000. Estonia is a flat country covering 45,339 km2 (17,505 sq mi). Estonia has a long, shallow coastline (3,794 km or 2,357 mi) along the Baltic Sea, with 1,520 islands dotting the shore. The two largest islands are Saaremaa (literally, island land), at 2,673 km2 (1,032 sq mi), and Hiiumaa, at 989 km2 (382 sq mi). The two islands are favorite Estonian vacation spots. The country's highest point, Suur Munamägi (Egg Mountain), is in the hilly southeast and reaches 318 m (1,043 ft) above sea level. Estonia is covered by about 18,000 km2 (6,950 sq mi) of forest. Arable land amounts to about 9,260 km2 (3,575 sq mi). Meadows cover about 2,520 km2 (973 sq mi), and pastureland covers about 1,810 km2 (699 sq mi). There are more than 1,400 natural and artificial lakes in Estonia. The largest of them, Lake Peipus (3,555 km2 or 1,373 sq mi), forms much of the border between Estonia and Russia. Located in central Estonia, Võrtsjärv is the second-largest lake (270 km2 or 104 sq mi). The Narva and Emajõgi are among the most important of the country's many rivers. A small, recent cluster of meteorite craters, the largest of which is called Kaali are found near Saaremaa, Estonia. It is thought that the impact was witnessed by the Iron Age inhabitants of the area. Estonia has a temperate climate, with four seasons of near-equal length. Average temperatures range from 16.3 °C (61.3 °F) on the Baltic islands to 17.1 °C (62.8 °F) inland in July, the warmest month, and from −3.5 °C (25.7 °F) on the Baltic islands to −7.6 °C (18.3 °F) inland in February, the coldest month. Precipitation averages 568 mm (22.4 in) per year and is heaviest in late summer. Estonia's land border with Latvia runs 333 km (207 mi); the Russian border runs 324 km (201 mi). From 1920 to 1945, Estonia's border with Russia, set by the 1920 Tartu Peace Treaty, extended beyond the Narva River in the northeast and beyond the town of Petseri in the southeast. This territory, amounting to some 2,300 km2 (888 sq mi), was incorporated into Russia by Joseph Stalin at the end of World War II. The Soviet army used the Pakri Islands as sites for aerial bombardment. The collection and destruction of thousands of Soviet explosive devices was mostly complete by 1997. One of the most burdensome legacies of the Soviet era is widespread environmental pollution. The worst offender in this regard was the Soviet army. Across military installations covering more than 800 km² of Estonian territory, the army dumped hundreds of thousands of tons of jet fuel into the ground, improperly disposed of toxic chemicals, and discarded outdated explosives and weapons in coastal and inland waters. In the 1990s, during the army's withdrawal from Estonia, extensive damage was done to discarded buildings and equipment. In October 1993, the Estonian Ministry of Environment issued a preliminary report summing up part of the degradation it had surveyed thus far. The report described the worst damage as having been done to Estonia's topsoil and underground water supply by the systematic dumping of jet fuel at six Soviet army air bases. At the air base near Tapa, site of the worst damage, officials estimated that six square kilometers of land were covered by a layer of fuel; 11 square kilometers of underground water were said to be contaminated. The water in the surrounding area was undrinkable, and was sometimes set fire by locals to provide heat during the winter. With Danish help, Estonian crews began cleaning up the site, although they estimated the likely cost to be as much as 4 million EEK. The Ministry of Environment assigned a monetary cost of more than 10 billion EEK to the damage to the country's topsoil and water supply. However, the ministry was able to allocate only 5 million EEK in 1993 for cleanup operations. In a 1992 government report to the United Nations Conference on the Environment and Development, Estonia detailed other major environmental concerns. For instance, for several consecutive years Estonia had led the world in the production of sulfur dioxide per capita. Nearly 75% of Estonia's air pollution was reported to come from two oil shale-based thermal power stations operating near Narva. The mining of oil shale in northeastern Estonia has also left large mounds of limestone tailings and ash dotting the region. Near the town of Sillamäe, site of a former uranium enrichment plant, about 1,200 tons of uranium and about 750 tons of thorium had been dumped into a reservoir on the shore of the Gulf of Finland. This was said to have caused severe health problems among area residents. In the coastal town of Paldiski, the removal of waste left by Soviet army nuclear reactors was also a major concern. The combined cost of environmental cleanup at both towns was put at more than EKR3.5 billion. Environment – current issues: air polluted with sulfur dioxide from oil-shale burning power plants in northeast; however, the amount of pollutants emitted to the air have fallen steadily, the emissions of 2000 were 80% less than in 1980; the amount of unpurified wastewater discharged to water bodies in 2000 was 1/20 the level of 1980; in connection with the start-up of new water purification plants, the pollution load of wastewater decreased; Estonia has more than 1,400 natural and man-made lakes, the smaller of which in agricultural areas need to be monitored; coastal seawater is polluted in certain locations. 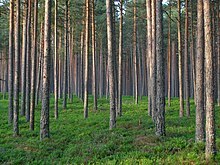 Forests cover more than half of the territory of Estonia. ^ Auer, M.R., Raukas, A. (2002). Determinants of environmental cleanup in Estonia. Environment and Planning C: Government and Policy, 20: 679–698. Wikimedia Commons has media related to Geography of Estonia. This page was last edited on 25 March 2019, at 14:33 (UTC).